Weekend. A lazy day. Not really. The spouse, The Father, The Brother and The Cousin was out of the house Saturday, dusk. They've gone deep sea fishing again. I just envy them. Boys/men can do whatever they want. I can do whatever I want too but personally, I had to ask for permission or I'd like a mutual understanding with my partner before I proceed, I sometimes procrastinate, for me consideration is vital, pros and cons are not games, they're the base of what you're going to deal with later; and if it involves distance e.g kilometers away, large crowd, unfamiliar places.. I'd wait for spouse before I proceed. When it comes to hobbies like updating the blog, DIYs, designing etc. I'd know no boundaries. Like this picture I spent few hours drawing yesterday. Well, I did procrastinate. I've been having this urge on painting since 2 weeks ago then today, it turned out I was to lazy to dig out my colours so I just made use of my pencils and eraser. Little things makes me happy and this is one of it. I actually didn't planned on drawing it the way it is but as I was watching adventure time, I spontaneously started drawing the horns. 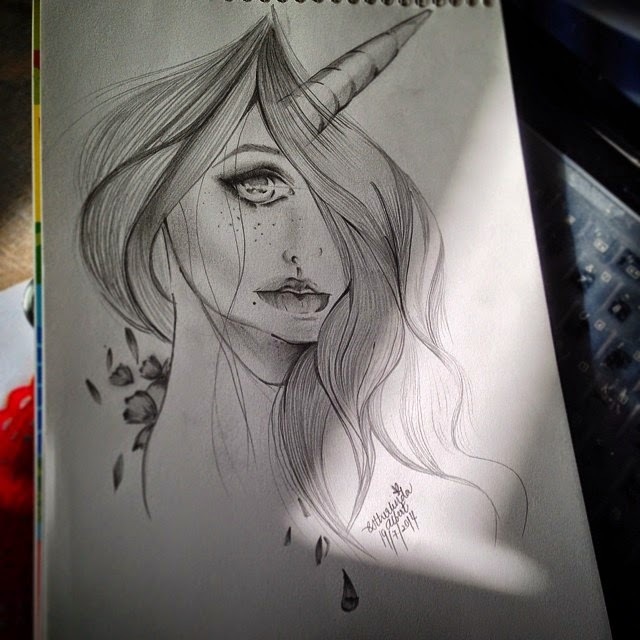 So it turned out to be a lady unicorn. It was hot out today, well, not that it isn't every single day but I feel like when I'm drawing, time goes by faster. Since I'm pregnant, I've been pretty emotional lately. I'd find tears dripping from my eyes constantly. More so if I thought of the spouse. Call me cheesy but, I have to admit it, it's better to miss your spouse than anything else. So, I appreciate this moment where I can pass time, not think, not drip and do what I like best- ART. I hope you had a great weekend. I've been boosting my H20 intake. Managed to go through 2 liters of water for 2 days in a row now! So happy with myself. :) love all your post! Norwhals sort of look like unicorns.